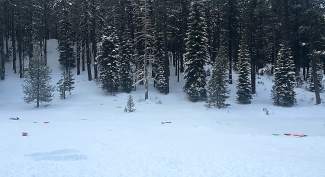 Several discarded sleds and pieces of trash are seen strewn about the sled hill at McIver Meadow off Donner Pass Road, across from the Villager Nursery, on Dec. 28 in Truckee. The chance was I could go to the Truckee Safeway at 3:45 p.m. Monday, buy a few items for dinner and get in and out before dusk. This being my ninth Tahoe winter, I should have known better. After circling the lot for 10 minutes, I found a parking spot. Inside was a scene I would define as one of muddled chaos. People everywhere, and the lines for each cashier stretched halfway up each aisle. I’m not exaggerating. There were just simply way too many people in Safeway. And so it goes living in a tourism town. Anyone who’s lived here (from newbies to longtime residents) knows what’s coming around the Christmas and New Year’s holidays, just like we know what’s coming for the Fourth of July and Memorial/Labor Day weekends — massive tourism crowds. It’s the ultimate Catch-22. Even if you’re the most loathsome local when it comes to tourists, everyone knows the impact big crowds have on our economy. From the Bay Area and beyond, rich families come to Tahoe and Truckee and spend money at our bars and restaurants, ski resorts, boutique shops, and everywhere in between. Part of me is gracious, considering the 4-year stretch of drought we just endured, right on the heels of the Great Recession. At Tahoe, it’s simple: If it snows, they will come, and we’re seeing it (and its economic benefits) right now in all its glory. To this, I offer the following: Tahoe- Truckee is not your personal trash bin. As you can see in the photo in this column, people apparently aren’t getting the memo, resulting in a head-shaking display captured Monday morning of discarded plastic sleds and other trash at the sled hill at McIver Meadow (check out the Truckee Police Facebook page for more pics). This is just one example. 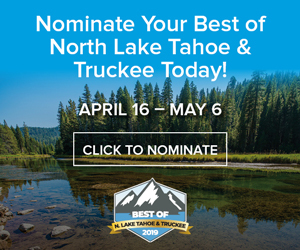 Anyone out and about the next few days across the greater Tahoe-Truckee region is bound to see trash piling up in high foot traffic locations. 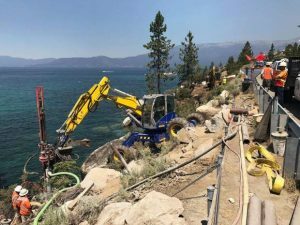 I think I speak for a lot of people when I say that Lake Tahoe and Truckee gladly welcome any and all visitors with open arms — but we would really appreciate you returning the favor by cleaning up after yourselves and being decent human beings when it comes to the common courtesies bestowed upon us as children. And just think — how many more people will want to live and visit here should all these proposed developments come to fruition? Kind of puts a whole new spin on the phrase “Dumb and Dumber,” doesn’t it? Kevin MacMillan is managing editor of the Sierra Sun and North Lake Tahoe Bonanza. He may be reached for comment at kmacmillan@sierrasun.com.